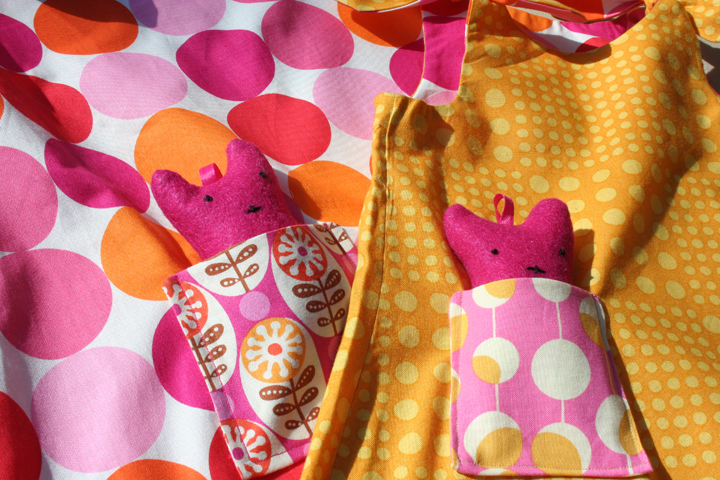 One New Look pattern for baby plus one pocket and one pocket friend from Lotta Jansdotter’s Simple Sewing for Baby and what do you get? 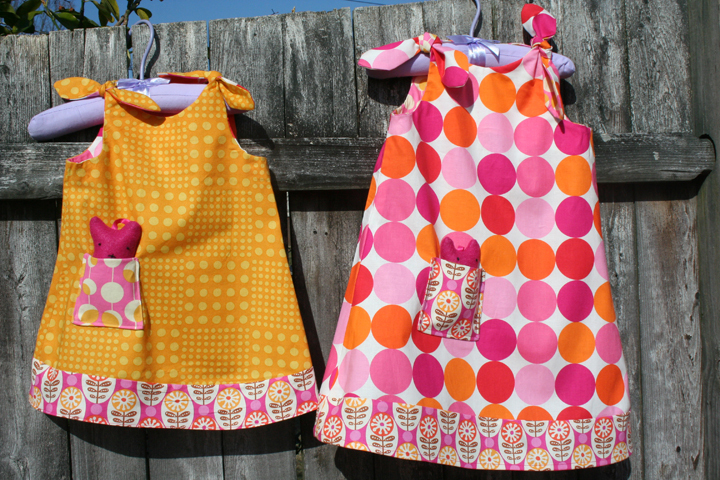 The daisy dresses! 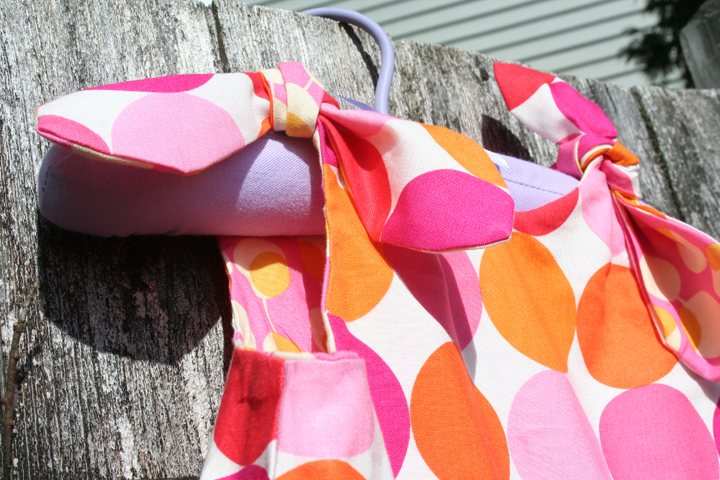 I’m calling them the daisy dresses because they are just so darn bright and cheery. 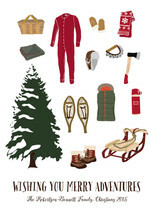 Plus daisies are my favorite, you know. 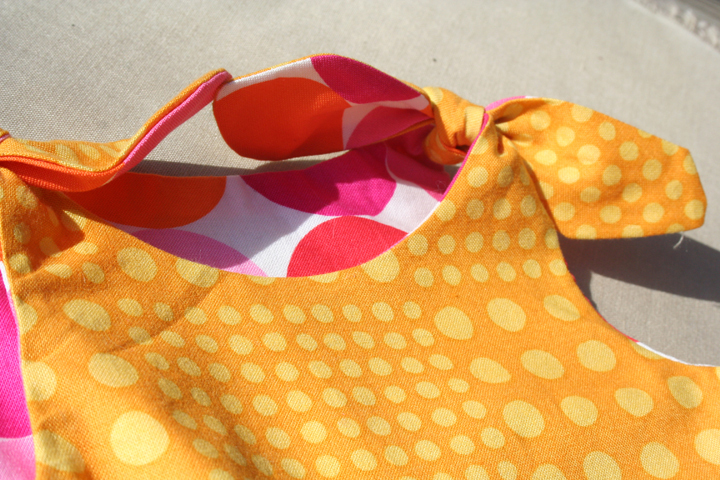 I went a little fabric-happy with a combination of prints from Amy Butler, Michael Miller and Westminster Fibers. They were all so delicious that I just had to include as many of them as I could. Hence the contrast facings, pockets and bands. If I could eat these dresses, I would. So Lotta’s book, that I was lucky enough to get for my birthday, is as simple and wonderful as you would expect. 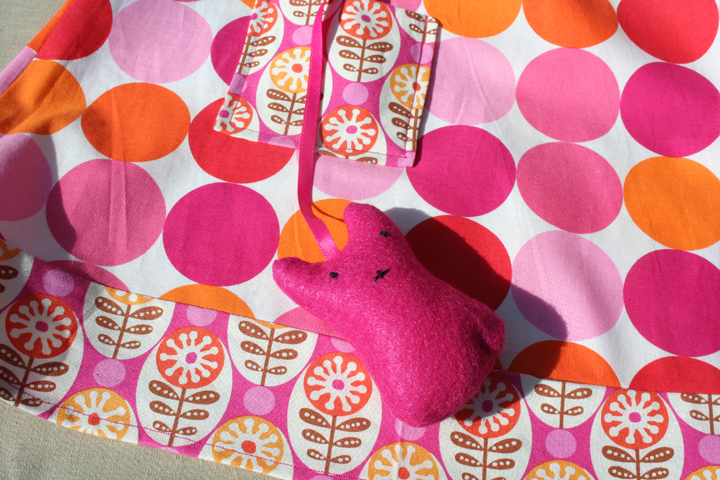 The book includes a very simple dress pattern with this little pocket and pocket friend. The dress was a little too simple for me. At least for these birthday present dresses. 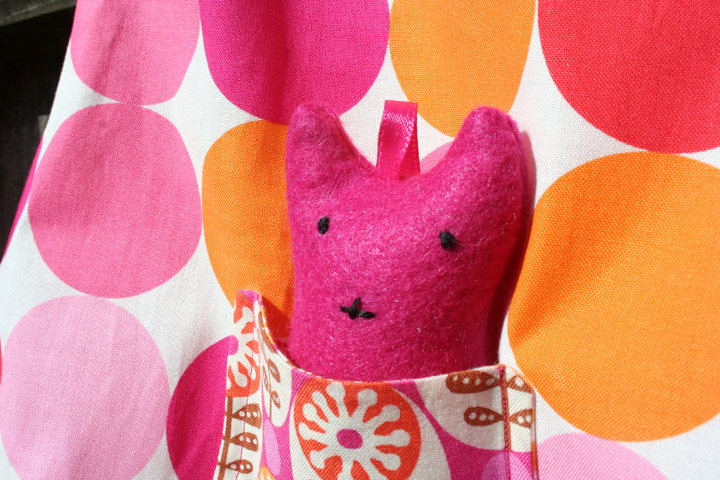 But the pocket with pocket friend was so unbelievably cute, I knew I had to stick them on something straight away. Pocket friend is tacked into the pocket via some 1/4 inch satin ribbon. Lotta had suggested this as a way to always have the pocket friend close at hand. Surely pocket friend may avoid an untimely demise this way, but I’m wondering if this may prove to be slightly irritating for the moms who will wash the daisy dresses. I did fill the pocket friends with polyester fill so as to allow realistic washing and drying, but I think I’ll also include a little disclaimer that pocket friends can be quickly untacked from their respective pockets if that makes life easier. Either way, they are unbelievably cute. 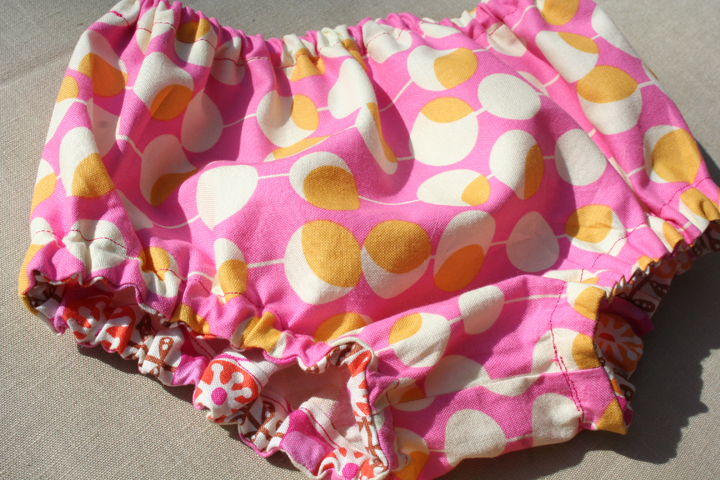 And what’s a cute little daisy dress to do without an equally cute pair of bloomers to go with it? 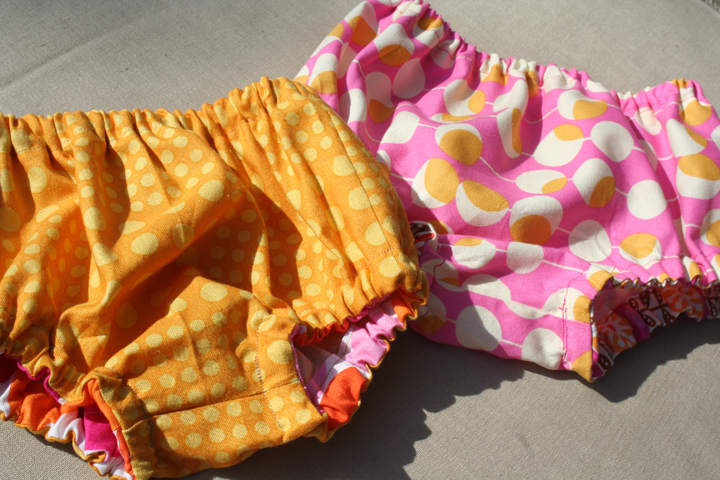 The bloomers also come from Simple Sewing. I added a little contrast binding for the elastic because I just couldn’t resist more patterns. More patterns! Cute. Cute. Cute.